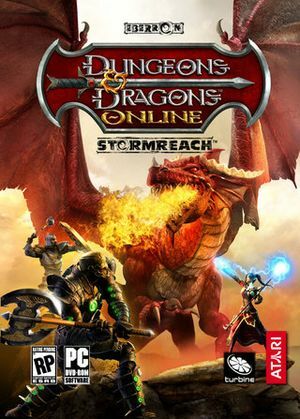 Previously marketed as Dungeons & Dragons Online: Stormreach and Dungeons & Dragons Online: Eberron Unlimited. All versions require a Turbine Account. Frame-rate limiter exists in game under Troubleshooting options. The slider begins at 15fps up with a cap of 120fps or unlimited. This error can appear if trying to log in using another Turbine account, for a game such as Lord of the Rings Online. This is because their account management system cannot automatically add the Dungeons and Dragons Online subscription automatically. It has to be done manually by contacting Turbine account management support. If the in-game store appears as a blank page or is missing elements there's a chance that the built-in browser's files got corrupted. To fix the problem go to Dungeons & Dragons Online's folder and delete the browser folder. Upon restarting the game the launcher will download the files again, solving the issue. ↑ File/folder structure within this directory reflects the path(s) listed for Windows and/or Steam game data (use Wine regedit to access Windows registry paths). Games with Steam Cloud support may store data in ~/.steam/steam/userdata/<user-id>/206480/ in addition to or instead of this directory. The app ID (206480) may differ in some cases. Treat backslashes as forward slashes. See the glossary page for details.